Ten days gives you time to start padding your meals with extra calories and to embark on a regular gym routine, but gaining more than 1 to 2 pounds so quickly is exceptionally challenging and not a smart step toward good health. Gain weight at a rate of about 1/2 to 1 pound per week to encourage the development of lean, healthy muscle mass, not just body fat. Gaining weight can be as difficult, if not more so, than losing weight -- especially if you have a light appetite, an active lifestyle or a genetically high metabolism. Gaining 1 pound requires you consume 3,500 calories in addition to what you need to maintain your weight. Most people burn between 1,600 and 3,000 calories each day. Theoretically, to gain a pound per day, you'd have to consume between 5,100 and 6,500 calories. To gain even half of that -- just 5 pounds in 10 days -- you'd need to increase your intake by the still considerable 1,750 calories per day and consume between 3,350 and 4,750 calories. Just adding calories from any sources will cause your weight to increase, but a sound plan emphasizes extra calories from from mostly whole, healthy foods, specifically whole grains, fruits, vegetables, dairy or non-dairy substitutes, unsaturated fats and proteins low in saturated fat. To reach the intake levels that will add 5 to 10 pounds in 10 days, you'd likely have to resort to calorie-dense, but nutritionally lacking, processed snacks, fast food and indulgent restaurant meals. These junk foods aren't conducive to strengthening muscles and bones, or helping your body recover from an illness that may have caused excessive weight loss. Such rapid weight gain means you'd be packing on fat, not lean muscle. A moderate 250- to 500-calorie surplus per day, however, will help you gain from about 3/4 to 1.5 pounds within 10 days. You can add these calories with whole, unprocessed foods and without feeling uncomfortably full. At meals, increase portion sizes -- especially protein and whole grains -- by 10 to 20 percent. Alternatively, raise the calorie count of the food you currently eat. Choose higher calorie, healthy foods when given a choice. Go for chili instead of chicken noodle soup; opt for dense, whole-grain bread instead of light white bread; pour a bowl of granola rather than corn flakes; have a serving of broccoli topped with melted cheese instead of a small lettuce salad with dressing on the side. Add high-calorie ingredients to your favorite recipes to encourage weight gain. Add walnuts and raisins to oatmeal; spread peanut butter on your morning whole-wheat muffin; top scrambled eggs with cheese; add an avocado to your salad or sandwich; sprinkle sunflower seeds on your salad; toss pasta in olive oil before adding sauce; dip breadsticks in seasoned olive oil; or add powdered milk to your favorite casserole. Two tablespoons of peanut butter adds 190 calories, an ounce of cheddar cheese adds 114 calories and 1/4 cup of sunflower seeds adds about 200 calories. Graze and snack more often to add calories. 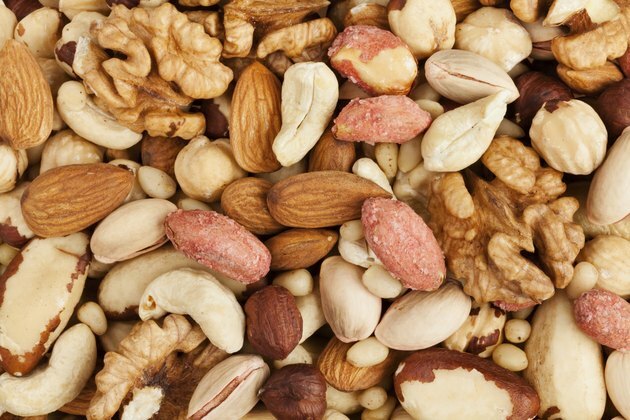 A handful of nuts, container of yogurt, hunk of cheese with woven wheat crackers or a peanut butter sandwich on whole wheat are portable snacks that contain protein for muscle growth and carbs for energy. A quality pre-bedtime snack, in addition to one mid-morning and mid-afternoon, helps you gain as much healthy weight as possible in 10 days. Instead of mindlessly polishing off a carton of ice cream or bag of chips in front of the television, opt for cottage cheese with raisins, dates with almond butter, or a smoothie made with frozen berries, a banana, kefir and honey. Weight training aids weight gain by encouraging development of muscle mass. You can't make considerable gains in 10 days, but a new program can turn into a long-term routine. Plan at least four sessions for the 10-day period to occur on non-consecutive days. Target every major muscle group with at least one set of four to eight repetitions using heavy weight that makes it nearly impossible to finish with good form. Exercises like squats and deadlifts work your lower body; planks, twists and wood chops work your core; and push-ups and rows strengthen your upper body. After one hard workout, you might notice a swell -- or pump -- in your muscles that lasts for several hours. This swelling is the result of fluids rushing in to address the trauma created by the resistance training. The pump is temporary, so consider timing your workout to coincide with an activity connected to your reason for gaining weight, such as a bodybuilding show, photo shoot or hot date.